How can I add a password to a folder on my computer? "I want to keep other people who use my computer from accessing some of the files in a folder. Is there a way I can add a password to a folder on my computer?" The default security settings in Windows don't make it very easy to password protect a folder from other people who access your computer. If you were trying to password protect a folder from being accessed by other computers, that's a pretty easy thing to do. The easiest way to password protect a folder on your computer is to install some additional software. If you want to add a password to a folder on your computer, the first thing you want to do is download and install Folder Lock. The software encrypts the folder you want to protect and allows you to add a password to prevent unwanted access. The reason I like Folder Lock as opposed to other solutions is that the interface is extremely simple to use. You install the application on your computer, choose the folder you want to password protect, choose a password, and you're done. You can effectively password protect any file on your computer, whether it's a document, photo, video, or anything else. The biggest risk is that you don't want to forget the password you used to protect the directory. Because the files are encrypted, there's pretty much no way to get them again if you forget the password, so make sure you store the password in a secure place, just in case you ever forget. 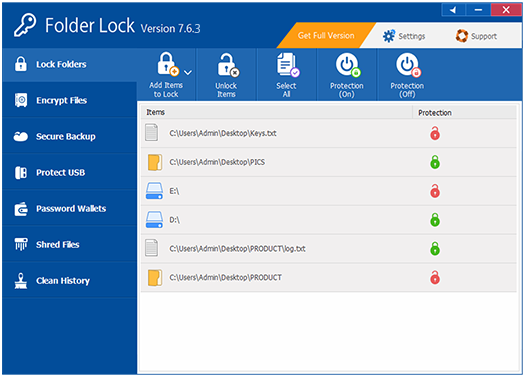 Download Folder Lock and start password protecting your folders.